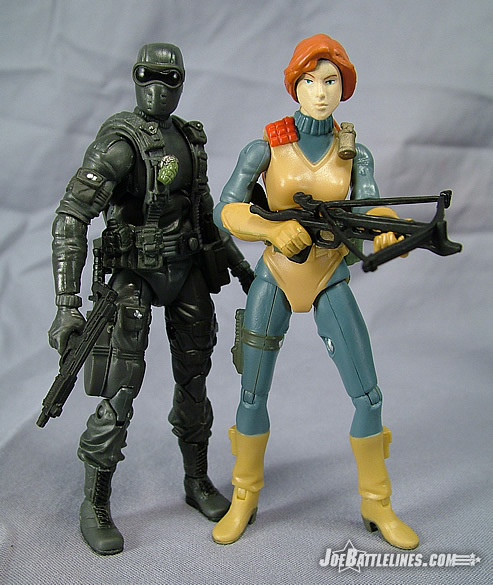 As a young GIJoe fan, a new version of Snake Eyes was an event to look forward to. 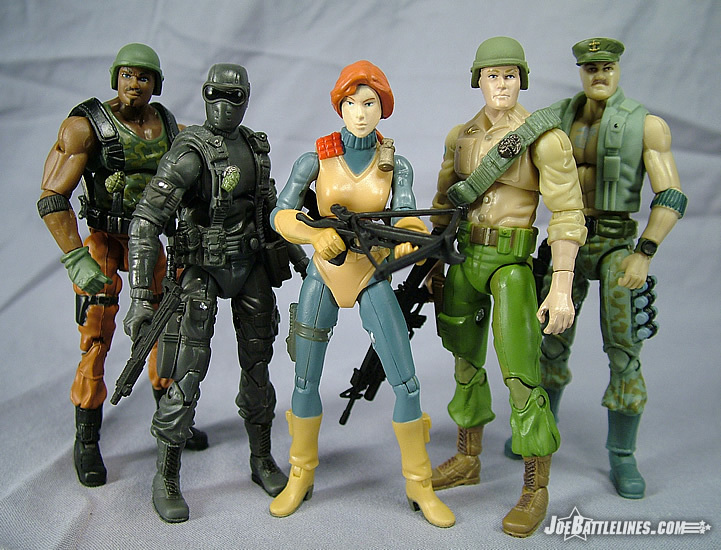 This was in those halcyon days of yore—before every other wave contained a new version of the team’s premiere commando and the odd waves offered repaints. Back then, Snake Eyes was a character I knew primarily from the comic books and that version made the greatest impression upon my “fragile little mind”. 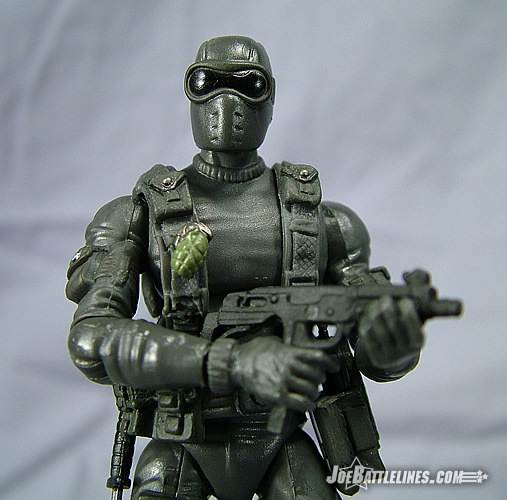 While I always appreciated the ninja aspects of his background, my Snake Eyes was a soldier first and foremost and I always gravitated toward figures that emphasized this less mystical aspect of his nature. 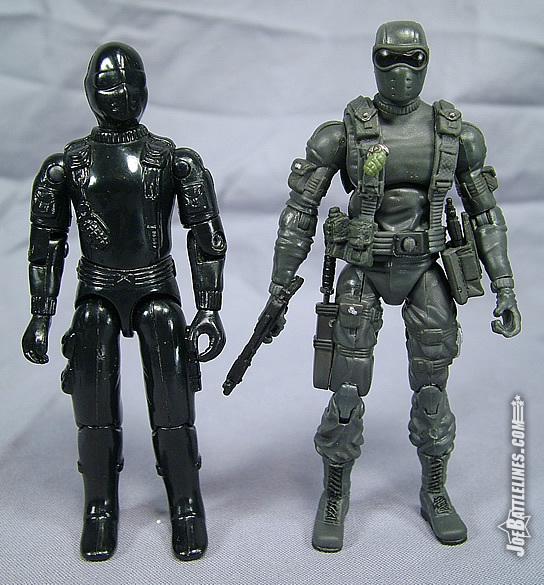 When the 25 th Anniversary series was announced, I figured that I’d see yet another version of the classic Snake Eyes v2 mold and I was only partially wrong. Saving the v2 for a single pack, the classic 1982 Snake Eyes design is back in the premiere battle pack and I have to say, it’s not all that bad. 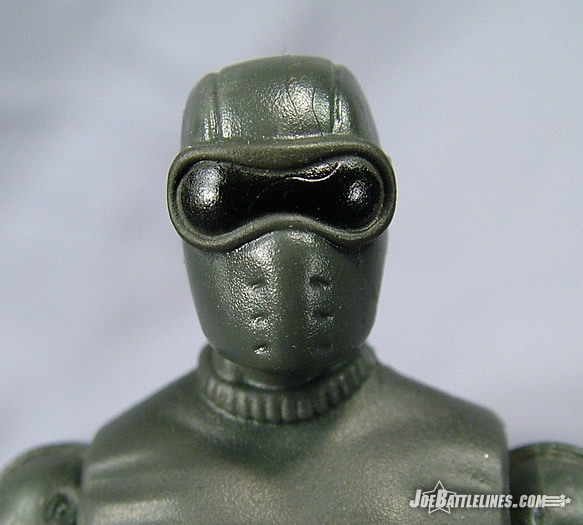 The head sculpt of this Snake Eyes is darned near perfect in my eyes. For some reason I find the goggles to be slightly over-sized but the other almost imperceptible detailing on the mask makes up for this. 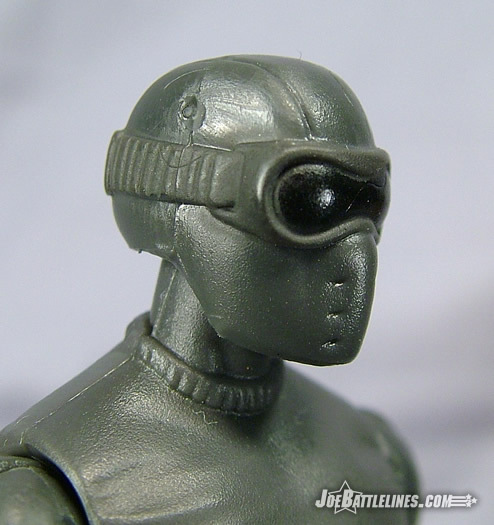 There are small vents over his mouth and sculpted seams over the top of the cranium which makes for a very classic Snake Eyes head. I can’t fault the sculpting on this figure one bit. The same can also be said for the included gear and the Silent Master comes with a fair amount of it. He’s packing his signature Uzi, a combat knife, an automatic side arm and an explosives satchel. Not since 1982 has an incarnation of this character included the satchel which puzzled many young fans back in the day. Surely, someone like Snake Eyes wasn’t carrying a purse! 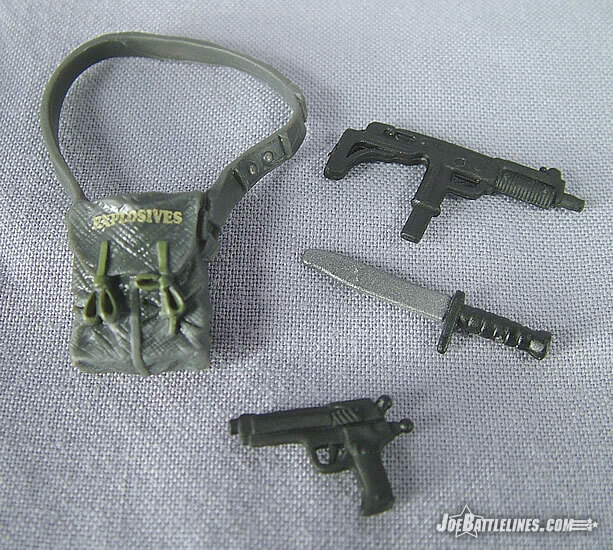 The “man bag” is actually surprisingly well-detailed and even features two small paint applications—one for the draw strings and one for the word “explosives”. 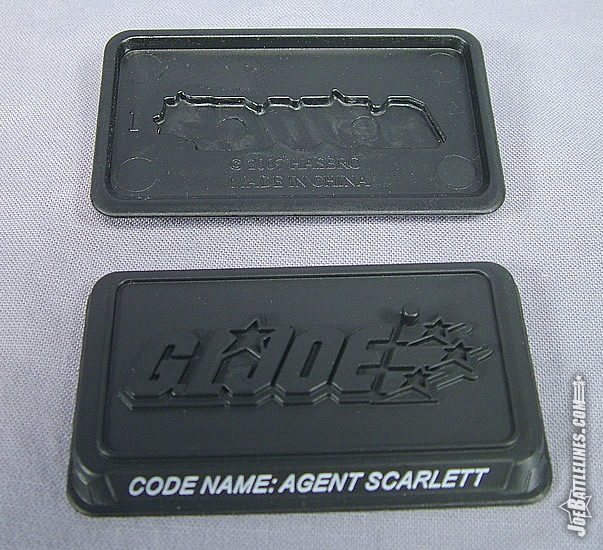 Snake Eyes also comes with the requisite figure stand and replica original file card. I’ve noticed a pattern with this line in writing these reviews: figures with double-jointed knees cannot sit properly. 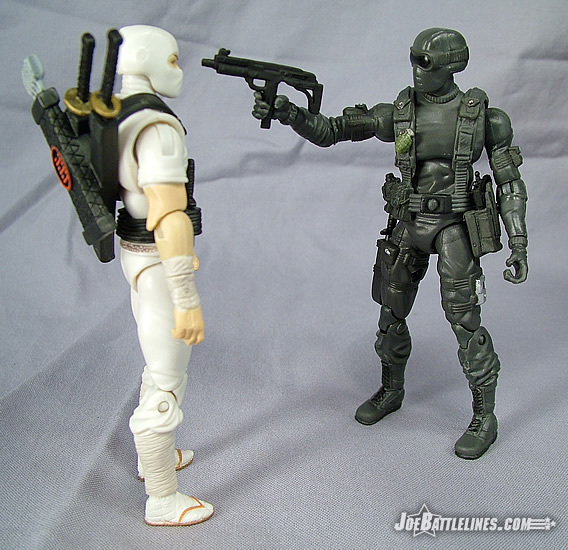 Snake Eyes is no exception to this as the “diaper crotch” as it has been referred to on various forums simply does not allow for the same range of movement found in his 1982 version. 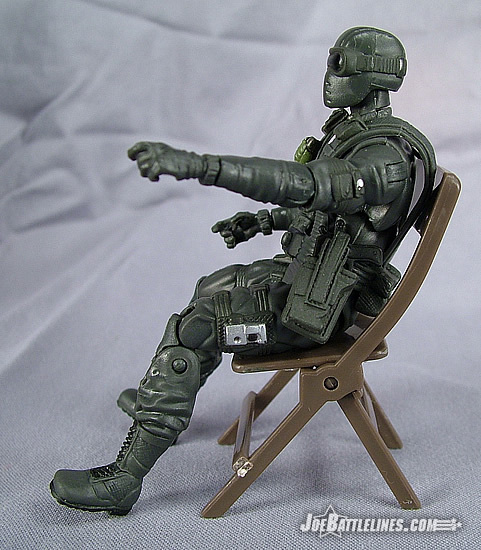 The mid-torso joint, which was presumably designed to compensate for this as well as the lack of waist joint, is once again completely ineffective and Snake Eyes ends up slouching in his seat with the best of them. This is real shame as I find myself drawn to this figure’s design more than I did the VvV wave 7 version preferred by so many collectors. 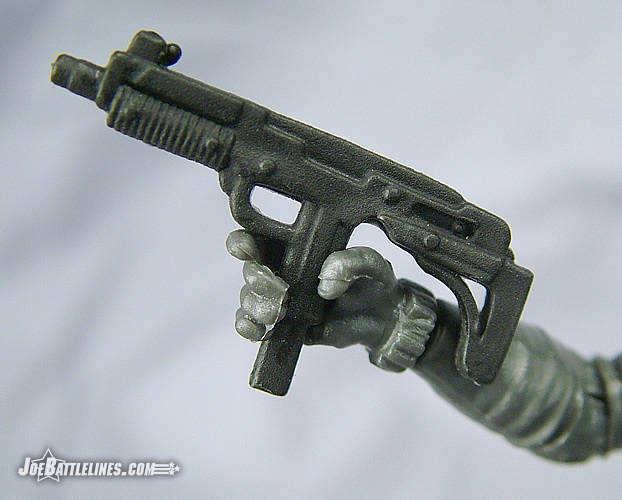 The only other issue I have with this figure, and this one is really pretty minor, is that he has a sculpted trigger finger on his right hand that cannot fit inside the trigger guard of his Uzi or his pistol. 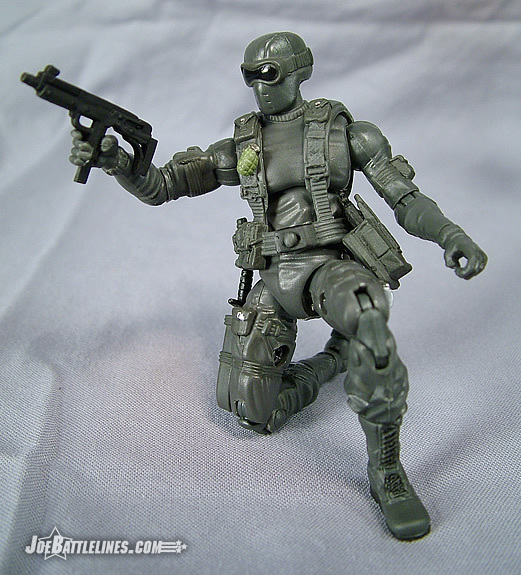 It keeps him from achieving a proper pose with his pistol but, to be fair, this has been an ongoing issue with 3.75” Joes since trigger guards were sculpted on the weapons. Still, it’s something to pay attention to when trying to insert his weapons into his tiny tiny hands. 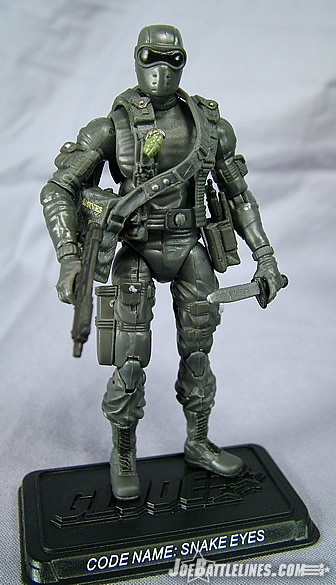 I’m going to come across as one of those “old fogies” but had this figure been built on DTC construction, he might have been the best Snake Eyes figure produced to date. In all honesty, the sculpting on this figure is fantastic and he works well with both the more animated style used for most of the figures in this line as well as more traditional Joes. He’s one of the shortest figures in the 25 th line which means that he might have a prayer of interacting with some of the GvC 4” figures reasonably well. However, like many of his 25 Anniversary brethren, his movement is restricted by an ill-conceived design that doesn’t offer any significant improvement in articulation. (I suspect that these figures are cheaper to produce—hence the design change.) As a result, he’s just not the “the most detailed and articulated G.I. JOE figures ever” that was described in the initial press release. Snake Eyes is one of those figures that reaches his tiny hands out toward greatness only to stop mere inches short of grabbing the brass ring. Aside from Roadblock, he’s the only other figure that I can give a decent recommendation for inclusion into most collections. It’s just a shame that he won’t fit in with the majority of the figures.